I was recently able to attend a launch party for Music and Literature no. 2 at the home of the publishers of The American Reader. This event was crammed with wonderful and very intelligent publishing folk. All 25 copies of M&L no. 2 at the party were purchased, and it was quite a thing to see a house packed with people energized by the work of László Krasznahorkai, Béla Tarr, and Max Neumann. This was a remarkable collection of people who are doing good things for the world of literary translation, and, I would argue, literature more generally. The event itself was also astounding: first readings of Stig Sæterbakken’s and Krasznahorkai’s work, then a thirty-minute performance of incredibly demanding chamber music by Alfred Schnittke, Olivier Messiaen, and Arvo Pärt by Juilliard grads. Music & Literature was honored to join the prestigious Norwegian journal Vagant as well as the Berlin-based kookbooks and the Swedish writer and editor Carl-Michael Edenborg in a quadruple, multilingual, cross-arts launch event. The evening’s eclectic program included a reading by Carl-Michael Edenborg from his newly released The Parapornographic Manifesto; Sigurd Tenningen and Vagant Editor-in-Chief Audun Lindholm reading from their first issue of 2013; the poet Sabine Scho reading from her book Tiere in Architektur; and the co-editor of Music & Literature Daniel Medin reading in English a newly translated piece of fiction by the Hungarian author László Krasznahorkai, with Bora Hegyes presenting the same piece in the original Hungarian. Berlin-based designer and visual artist Andreas Töpfer, who had recently been awarded gold in the year’s most beautiful book competition in Norway, was also featured. 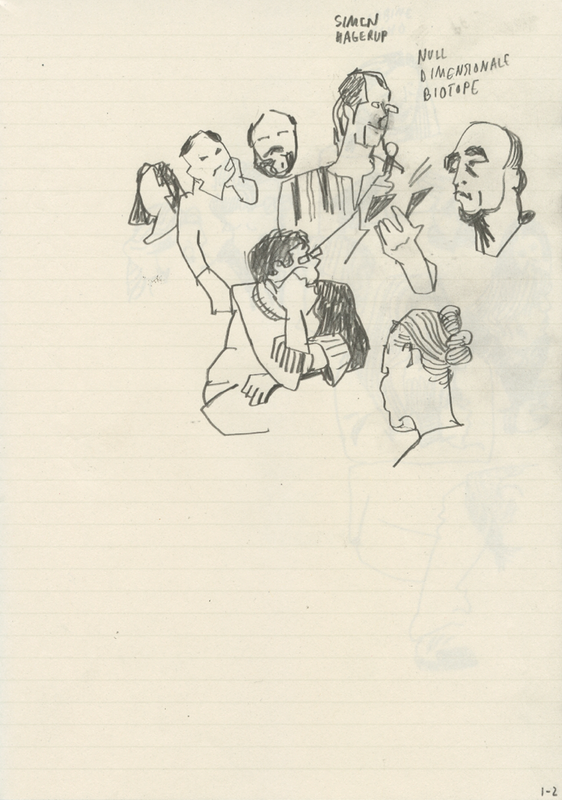 The evening’s events were sketched by Andreas and have been collected (along with sketches done by attendees of other Music & Literature events) in an album on our Facebook page. Audun Lindholm dedicated the evening to his friend and ours, the late Norwegian author Stig Sæterbakken, in whose memory Music & Literature no. 1 is dedicated and whose work is featured in Music & Literature no. 5. All photos courtesy of Ingrid Pop.